Have you volunteered (or been coerced) into organising leaver’s hoodies for your school year? It’s a great way to develop organisational, time management and communication skills that you can utilise in the next stage of your education or in the world of work. You also get the satisfaction of creating a lasting memento for your peers. If you’re a bit unsure about where to start or how to manage the task you’ve taken on help is on hand. We asked recent school leaver and hoodie organiser Olivia to share her tips for making the leaver’s hoodie process stress-free and enjoyable. Come up with a small team of around 3-5 students to help you organise the hoodies. Have a quick show of hands in assembly as to how many people want leaver’s hoodies. 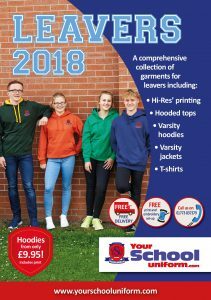 Email leavers@yourschooluniform.com with the number of students wanting hoodies and they will produce a price per hoodie and give you additional information on colours, logos and embroidery. You also need to tell them if you want extra names or initials on the hoodies. The fun part is definitely choosing the design and colour of the hoodies. What’s not so fun is everyone wanting something different! Narrow the design and colour choices down to 4 or 5. Once you’ve shortlisted designs and colours, invite everyone to cast their vote (use a free platform like Survey Monkey). Remember to set a deadline and whichever gets the most votes wins, simple as that. You will now need to organise everyone’s orders and requirements. Create an order form and distribute it throughout the school or YourSchoolUniform.com has a template which you can use and they can send this to you by email. It includes all of the information you’ll need to produce the hoodies, including fields for everyone’s names, nicknames etc. Be clear on deadlines and work out how long you’ve got for each stage right at the beginning. However there will always be someone who doesn’t get the concept of deadlines or makes out that they weren’t told. To prevent this from being a problem, set deadlines a few days before the real deadline. Agree with the school how payment for the hoodies should be collected from everyone, there is probably a way already set up. Yourschooluniform.com will send an invoice directly to the school. Collect all your orders in and put them all into one master order form – this is easier if you do it as you go along and get a couple of people to check the order form. It saves a massive task at the end. It’s worth giving the final order a double check too. Send your completed order form to leavers@yourschooluniform.com. Now all that’s left to do is sit back and wait for the beauties to arrive along with lots of compliments for the great job you’ve done! Planning leaver’s hoodies for 2018? YourSchoolUniform.com are on hand to help. Check out our Leavers 2018 brochure.